According to the Wild Blueberry Association of North America, researchers have discovered that combining blueberries with exercise offers two potential health benefits – the ability for the body to burn fat longer after exercise, and improved absorption of inflammation-reducing antioxidant compounds called polyphenols. Combining blueberries and exercise can benefit athletes of all fitness levels. Weekend warriors and elite athletes can benefit from combining blueberries and exercise. Researchers in North Carolina have discovered that combining blueberries with exercise offers two potential health benefits – the ability for the body to burn fat longer after exercise, and improved absorption of inflammation-reducing antioxidant compounds called polyphenols. Elite athletes, like those who participated in the study, are not the only ones who may benefit from the combination of blueberries and exercise. “This is good news for weekend warriors, too,” noted study co-leader Dr. Mary Ann Lila. Long-distance runners were given a soy protein complex containing polyphenols from blueberries and green tea for two weeks, followed by three days of running 2.5 hours per day. This group of runners showed higher rates of absorption of beneficial polyphenols, and their metabolism rate remained elevated longer after exercise compared with runners who were given only the soy protein complex. Researchers know that polyphenols, naturally occurring compounds that are abundant in blueberries, and even more so in Wild Blueberries, work in the body to reduce inflammation and oxidative stress. Increasing the body’s ability to absorb polyphenols means the body can better fight inflammation and oxidative stress. The study also found an increase in the body’s ability to burn fat after exercise. Metabolic afterburn – the spike in metabolism that occurs after exercise – lasted longer in the group that ingested the blueberry/green tea complex. This increased fat burning ability lasted 14 hours after exercise ended. “The test group burned fat while they slept – a terrific message,” said Dr. Lila. “The findings in this study are encouraging for everyone. They are another demonstration of the potential benefits of consuming blueberries before and after exercise,” said Dr. Lila. The study authors are David C. Nieman, Amy M. Knab and R. Andrew Shanely of the Human Performance Laboratory, Appalachian State University, North Carolina Research Campus; Nicholas D. Gillitt and Fuxia Jin of the Dole Nutrition Research Laboratory, North Carolina Research Campus; Kirk L. Pappan, Metabolon, Inc., Durham, North Carolina; and, Mary Ann Lila of the Plants for Human Health Institute, North Carolina State University, North Carolina Research Campus. The study was published in Plos One on August 15, 2013. The Wild Blueberry Association of North America (WBANA) is a trade association of growers and processors of Wild Blueberries from Maine and Canada, dedicated to bringing the Wild Blueberry health story and unique Wild Advantages to consumers and the trade worldwide. 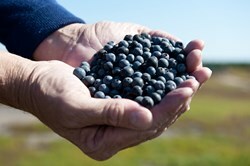 WBANA is dedicated to furthering research that explores the health potential of Wild Blueberries. Every year since 1997, WBANA has hosted the Health Research Summit in Bar Harbor, a worldwide gathering of scientists and researchers whose work is leading the way in learning more and more about the health benefits of Wild Blueberries. http://www.facebook.com/wildblueberries and http://www.facebook.com/wildblueberries and http://www.twitter.com/WildBBerries4U.